Book online to check prices and availability. 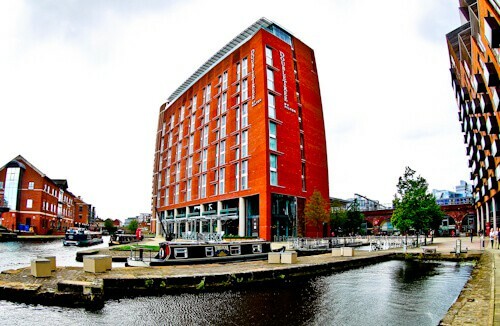 The hotel is located in Granary Wharf which is accessible from the Leeds train station south exit. There is free parking available opposite the hotel under the train station, arriving by car or train the location is perfect. One of the points of interest of Leeds is the Leeds and Liverpool canal (above). To walk to the city center of Leeds and the famous shopping district will take less than 10 minutes. Opposite the hotel is the free water taxi of Leeds which will take you to Leeds Dock, even if you don’t plan on visiting Leeds Dock I still recommend you take this for a free ride on the canal which gives a different perspective of the city. The check in area is huge, open and spacious (above). Check in was quick and the staff friendly, you’ll receive a delicious welcome cookie too. If you’re a Hilton Honors member then you’ll have your own priority check in desk. Free, fast and open WiFi is available in the lobby as it is throughout the hotel. As you would expect in a DoubleTree by Hilton the room is immaculate. The bed is super comfy and the flat screen TV offers a wide variety channels. The bathroom is also immaculate with bath and a walk in shower. There is coffee and a coffee machine in the room, just in case you are in need of a caffeine boost. There is a 24 hour gym on the 12th floor. 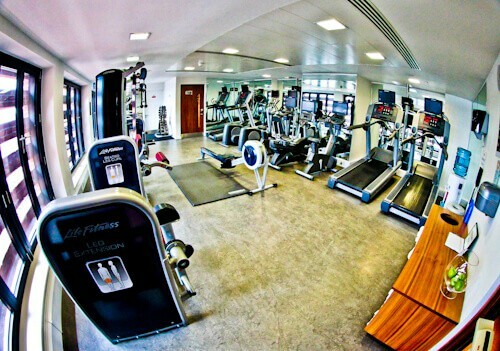 The gym is very good for cardio with running machines, cross-trainers, cycling machines and a rowing machine. If you want to do a workout then there are weight machines and free weights up to 22 kgs. There are towels and a water dispenser so no need to bring anything from your room. The view you can enjoy during breakfast is a view of the Leeds and Liverpool Canal, beautiful even on a cloudy day. A nice touch during the buffet breakfast was that not only did the staff top up the tea / coffee but they also topped up the juice, I’ve only experienced my juice being topped up on a cruise ship before, never in a hotel. The selection of hot foods, fresh breads and pastries were all delicious, I wish I could have managed to eat more! 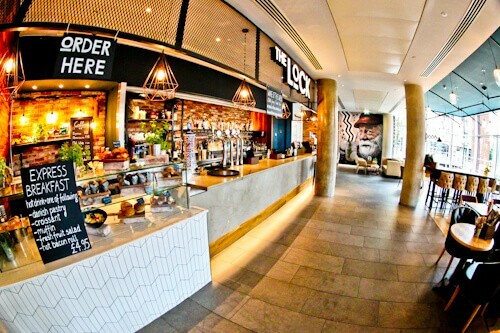 The Lock Kitchen & Bar (above) offers delicious snacks throughout the day until 10 pm. If you are looking for something good to eat in the afternoon or evening then I’d recommend checking out the menu here. 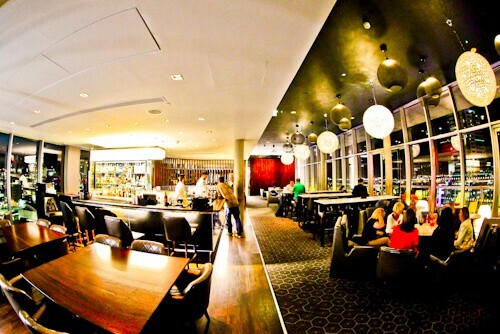 It’s also a good place for early evening drinks before heading upstairs to the Sky Lounge (below). When you check in you’ll be given a free drink voucher which you can use in the 13th floor Sky Lounge. The star of the show in the Sky Lounge is the view of Leeds, on one side you have a view of the city center and on the other side you have the canals and suburbs. 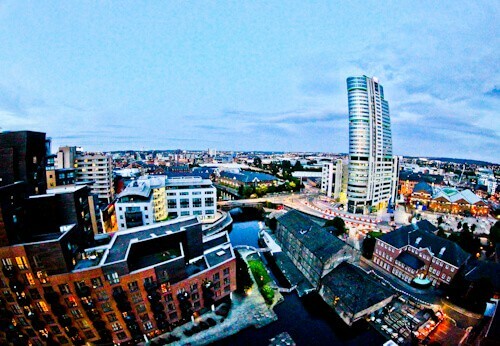 There is a balcony which you can sit out on to enjoy your drinks whilst taking in the skyline of Leeds. The view from the Sky Lounge is wonderful. Even if you don’t go to the bar for a drink you should visit to view the panoramic of Leeds. Sunset is a good time to visit the Sky Lounge as you’ll see Leeds in the light, followed by a beautiful sunset (weather permitting) before Leeds at night. Book online to check prices and availability. 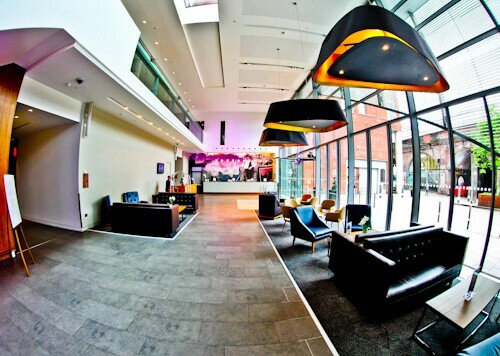 Enjoy your stay at the DoubleTree Hilton, Leeds. Visiting Leeds? Read about my Elland Road Stadium Tour review. I guess a name-brand hotel can never really disappoint. The great things about this hotel are its location and its amenities. I think Double Tree is also famous for offering warm cookies to its guests at some locations during check-in. The water taxi sounds right up my alley! We love staying at DoubleTrees. We can’t get enough of their warm chocolate chip cookies! But the free drink voucher sounds fabulous! That Sky Lounge view is superb! I am a big fan of the Double Tree brand and have often used them when travelling on business. This is certainly another great property and really chic with a pretty darn good location. One of the things that I like is that in most cases no matter where in the world you go, the service and quality is always great. This looks like a great place to stay at. I particularly like the gym. It has so many options there, not too small, not too big. This is a really good hotel option to keep in mind. Having grown up in Indianapolis where we have a canal and walk, it was nice to see the canal here and it would be a relaxing place to sit and have breakfast although the view from the Sky Lounge looks hard to beat. Normally when we travel we try to stay at one of a kind hotels, but at the same time the familiarity of a chain can be nice. Double Tree certainly has a good reputation for quality, and from the photos it seems this one lives up to that. 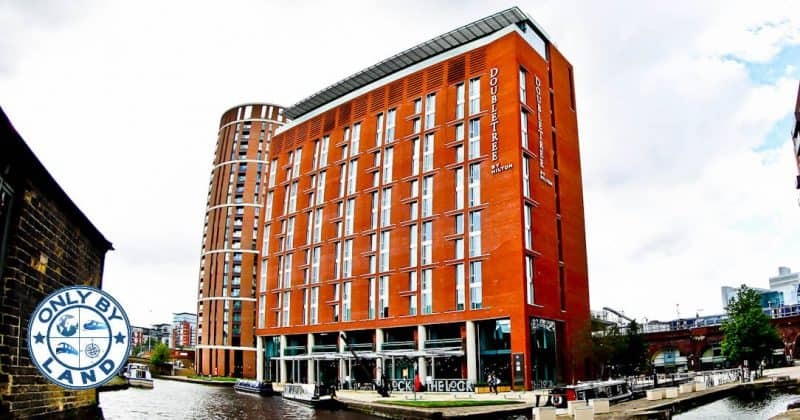 Leeds is new to me but I would love to experience it through the DoubleTree. The sky lounge seem to give a great overview over the city, perfect for sunset. 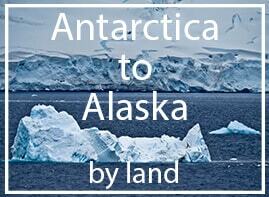 How awesome you can get there with a free water taxi. It looks like a really comfortable hotel. Hotel looks great I love Hiltons and it being so close to the train station would be a hit for me as I would probably arrive in Leeds by train. I am liking the view from the sky lounge I would love to stay here if I ever visit the city and its good to know that the food is also good. You can’t really go wrong with a Hilton – Every time You stay in one you know what you’re going to get and the service is usually brilliant. As a Leeds resident I don;t really have a need for a hotel in the area so unsurprisingly didn’t realise there was a DoubleTree here. The location seems perfect for either a business or recreational stay though. I might actually go there at some point to take advantage of the rooftop bar, the views look great! I’ve been in Leeds a couple of years ago, had I known there was such a nice hotel I would’ve booked there! I didn’t even know there are water taxis but if they are anything like those in The Netherlands, then I’d definitely use one! Also having a gym open 24 hour is such a huge bonus, it even looks pretty big! This hotel looks wonderful. 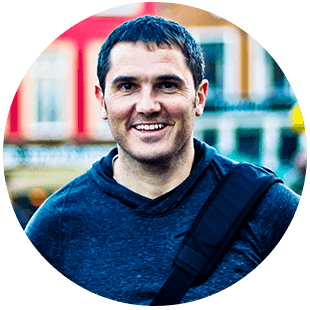 I always like to hear experiences with hotels so I know which ones to pick while I travel. The sky lounge sounds awesome! Such a lovely hotel! 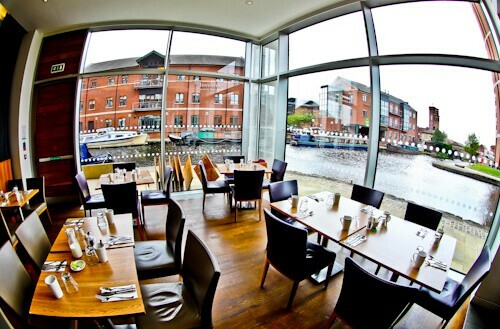 The view of the Leeds and Liverpool Canal from the dining area and the city view from the Sky Lounge are gorgeous. It really is a luxury hotel. I haven’t stayed at a DoubleTree before and this makes me want to try it! Double Tree always does a great job of providing quality services and cookies. Looks like they are continuing that trend over in Leeds. Especially with that sky lounge! Did you get to try their signature cookies? You had me at rooftop bar! 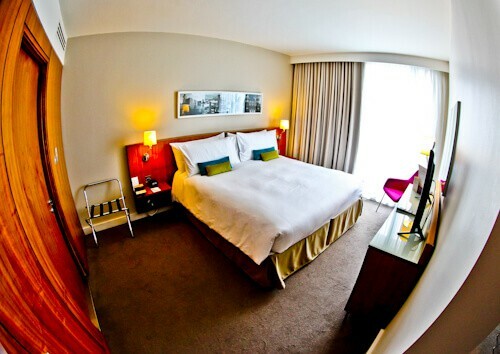 The Double Tree Brand has always been synonymous with quality that is good value. The rooms are always well presented and clean and it’s nice to see the Leeds one keeps up these standards. I like the vibe of this hotel. It looks modern and cozy. I like that the gym is open for 24 hours. I could not sleep sometimes when I stay in a hotel. Then, I would think of going out for a walk but I would prefer to go to the gym instead. The Sky Lounge looks great! It would be nice to hang out there and meet fellow travellers or just chill. Awesome review! I really enjoyed the read, James! Looks like a great place to stay! I try very hard to go with the flow when we travel and do as the locals do, but I really, really miss lots of hot tea in the morning. We just returned from Greece and a cup of hot tea in the morning was just that – a small cup. I was pining away for a BIG mug – multiple BIG mugs of plain hot tea. The unlimited tea and coffee offered at this hotel sounds heavenly!! Thanks for sharing your review and experience of the Double Tree. I’ve never been to Leeds, but I’ve stayed at Hilton hotels and have always enjoyed my stay. I need a good hotel to stay at in Leeds. I didn’t know they had a DoubleTree there and it’s in a perfect loction right next to the train station.